RGS uses the Clover suite of products to help organizations with system integration projects. Simply put, Clover is the brand from Razorleaf Corporation that encompasses tools and utilities for system connections. Clover allows RGS to perform system integration processes – in essence, we use Clover to connect System A to System B, System C, etc. Clover also has tools related to data extraction and data load for the cases where the data integration is not continuous, a one-time data load, or extraction. The illustration shows the components of the Clover brand and how different Clover modules work together as well as how they work with other commercial systems. Download a detailed flyer highlighting the benefits of Clover. Razorleaf Corporation has been in business for over 16 years and during that time they have conducted hundreds of data migrations. They have exported and imported hundreds of millions of records from a variety of systems. Clover Migration Utilities are the commercialization of those tools. When a client asks RGS to execute a data export or import we can leverage the Clover Migration Utilities to make this process faster and more accurate. Clover Plugins are endpoint connectors. An endpoint is some business system and a Clover Plugins is the connector that allows Clover to talk to that system. Clover-based solutions have been developed for SolidWorks PDM Professional, ENOVIA’s 3DEXPERIENCE Platform, Aras, SAP, NetSuite and Salesforce. and do the hard work. While the Clover Orchestration Server is the main consumer of Clover Plugins, in some cases, these plugins may be used as part of a data export or import so they might be used alongside of Clover Migration Utilities. Additionally, there may be cases were a Clover Plugins is used by some other middleware product. receiving jobs and invoking the correct plugin. Plugins in a specific order. The Clover Orchestration Server receives the job and then executes these plugins in the defined order and, in some cases, may even pass data from one plugin to the next. The Clover Orchestration Server also provides a user interface for job management as well as plugin configuration. Lastly, the Clover Orchestration Server can run on-premises or on-cloud depending on your specific integration needs. Clover Middleware Utilities are tools that extend, enhance or improve commercial middleware. In some cases organizations already have an existing commercial middleware solution like Jitterbit or Biztalk or Mulesoft. While all of these middleware solutions are very powerful, there are cases where an integration could be easier to build, more reliable or more capable with some middleware enhancements. That’s the purpose of Clover Middleware Utilities. Clover Middleware Utilities provide some of these enhancements on-top of commercial middleware. When Clover Middleware Utilities are used alongside existing middleware products, time to completion, solution capabilities and solution reliability are greatly increased. Whether your need is a one-time bulk data export or import or maybe you need a point-to-point solution to connect two or more business systems together, Clover can help. 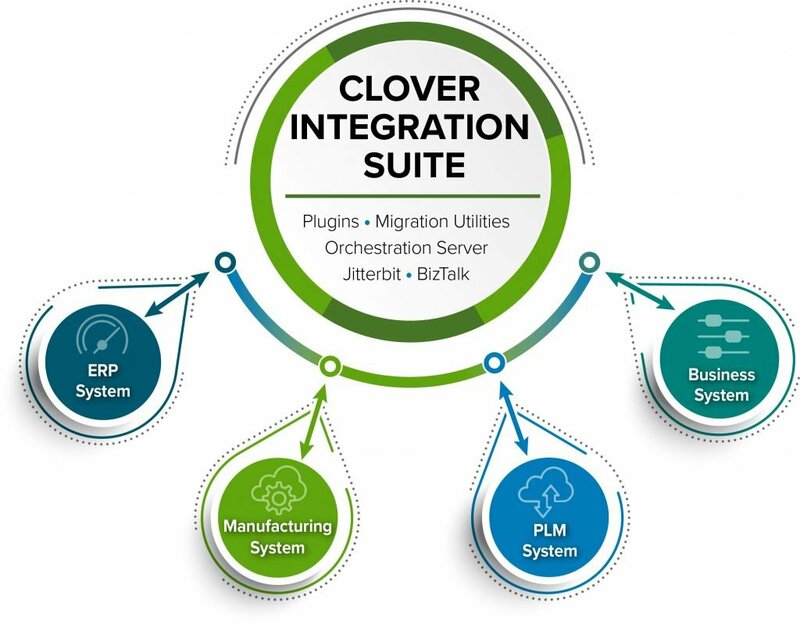 If you are looking for a more robust integration that will need job management, prioritization and orchestration or need some enhancements to your existing middleware product, Clover will support that level of integration. We are sure Clover can be of value to you for your integration needs.